This picture is based on an engraving of Diana by Giovanni Jacopo Caraglio of 1526 after a design by Rosso Fiorentino, from the series "Gods in Niches." A second inspiration is the two versions of Leda and the Swan (both lost) by Leonardo da Vinci. A copy after this picture was sold at Sotheby's Arcade Auctions, London, July 16, 1992, no. 210, and later at the Hôtel Drouot, Paris, June 30, 1993, no. 106, as French school, nineteenth century. Giampietrino was among the most faithful pupils of Leonardo da Vinci, who worked in Milan between 1482 and 1499 and again between 1506 and 1513. This picture, which shows the goddess of the hunt drawing an arrow to shoot the stag behind her, derives from Leonardo's studies for his celebrated painting of "Leda and the Swan" (destroyed in the seventeenth century but known through copies). From that source Giampietrino has taken over the accentuated contrapposto stance and the soft lighting. This is one of the earliest images to isolate Diana from a narrative context. 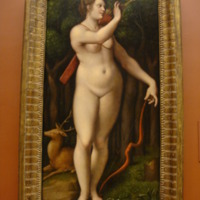 Giampietrino (Giovanni Pietro Rizzoli), Italian, Milanese, active by about 1495, died 1549, “Diana the Huntress,” Mapping Mythology: A Digital Collection of Classical Mythology in Post-Antique Art, accessed April 22, 2019, http://mappingmythology.com/items/show/51.